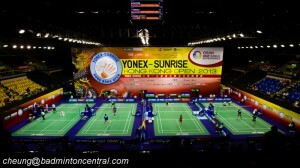 Second premier event of BWF World Superseries will kick off tomorrow morning, starting from qualifying round. Top echelon badminton shuttlers will show off their supremo this week, Putra Stadium certainly misses local hero Lee Chong Wei who unbeatable in seven consecutive years since 2008 edition at his homeground SS. Chen Long, Lin Dan, Jan O Jorgensen and newly crowned IND SS winner Srikanth Kidambi will be top contenders in this discipline but they should be wary to a string of the underdogs that frequently upset the frontrunners in big event. Kento Momota, Lee Hyun Il, Son Wan Ho, Chou Tien Chen and Viktor Axelsen may spoil the party. It’s big question whether defending champion Li Xuerui has fully recovered, she’s already losing world #1 status to Saina Nehwal but many believe this Chinese ace will bounce back. Regular favourites for WS are still not far from Nehwal, Marin, Sung JH, Tai TY and Chinese trio despite the latter displaying vulnerable lately. Both Lee YD/Yoo YS and Ahsan/Setiawan who reaped brilliant achievement in 2014 didn’t score inspiring outcome at All England last month so it’s time for them to back on right track, regain their superb play. Recent AE champion Boe/Mogensen along with Endo/Hayakawa, Lee SM/Tsai CH, Fu HF/Zhang N, Goh VS/Tan WK will enhance MD intensity and not possible to shine in KL. Who can conquer CHN WD pairs? Not many tournaments for others to shake their supremacy. Wang/Yu is strong candidate to crown first ever MAS Premiere victory. Beside their teammates, two familiar combos Matsutomo/Takahashi and Pedersen/Juhl are ready to defy the odds. Interesting to follow CHN new scratch pair, Olympic Champion Tian Qing who partnered with her junior Xia Huan. Undoubtedly, Zhang/Zhao, Fischer/Pedersen, Ahmad/Natsir level are above the others but the young sensation Liu/Bao has high potential to disrupt those three pairs hegemony and steal the show as they did in Dubai Finals and just concluded IND SS. It’s tough chance for Xu/Ma to defend their title, considering a series of flopped perfomances by the Chinese #2. The qualifying round will be important for most of home hopefuls to start their campaign here such as Chong Wei Feng, Liew Daren, Tee Jing Yi, Tan Aik Quan/Lai Pei Jing, etc. Sho Sasaki (JPN), Michelle Li (CAN), Sudket/Saralee (THA) have withdrawn according to ts.com last updated.